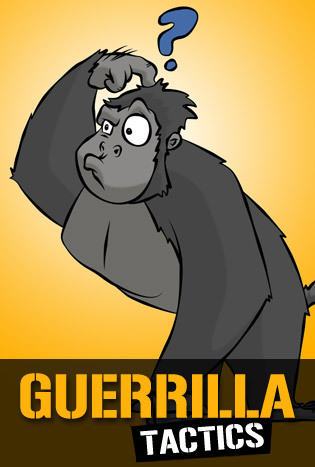 Home » Marketing » Is Your Marketing Gorilla or More Guerrilla? With Google’s constant updates and ever-changing webmaster guidelines, more and more businesses are ‘thinking outside of the box’ in terms of their marketing tactics.One way of spreading the word about their product or brand is viral marketing. For larger companies, this type of campaign is often handed over to advertising agencies to create the theme and decide how best to present it to the world. One of the most unforgettable viral campaigns was Cadbury’s drum playing gorilla, released in 2007, masterminded by the Fallon Agency and costing a colossal £6 million. The campaign was incredibly popular across the world and achieved almost one million views on YouTube in the week after its launch.Of course smaller businesses do not have the sort of budget to fund a campaign at this level, but finding something funny, odd, desirable or collectable that will appeal to a targeted audience, is a good start, as is deciding on the best way to get it out to them. Obviously the Internet is now the easiest way to speed up a viral marketing campaign and offers numerous channels for doing so. Social media often makes a big contribution to ‘going viral,’ and making the idea easy to share via social media buttons in appropriate places, could make a product or brand achieve notoriety overnight.YouTube obviously springs to mind when thinking of viral marketing, but the new image and video sharing sites, like Instagram and Pinterest, are rapidly growing a big list of subscribers and are set to continue that growth, so make best use of them. This is a group of people who have been organised to perform some sort of unusual activity designed to draw immediate attention to them. Flash mobs usually target a particular location at an agreed time, when there are plenty of passers-by and are generally wearing or otherwise displaying some sort of advertising material. This is using some form of cleaning process to make an image or write a message. It can be as simple as writing with a finger on a dirty window, or creating extremely elaborate designs made with industrial cleaning devices. It is entirely up to you whether you want to stick to some sort of gorilla-style ploy or take a step into the unknown with some guerrilla tactics, but either way, the creative process could be a whole lot of fun and add a whole new section to your SEO campaign. Mark currently works for Integrity SEO Experts, as a company they constantly refining their SEO strategy for that it fits in with the ever changing world of SEO.